A public appeal for people who can repair BBC Micro computers has been launched by a museum. The National Museum of Computing (TNMOC) needs help to maintain the stock of BBC machines it uses in education programmes and exhibits. It is looking for people familiar with the computer and its peripherals including monitors and disk drives. The 8-bit BBC Micro was launched in 1981 and gave many people their first taste of home computing. The museum, which is located on the Bletchley Park estate, has about 80 BBC Micro computers, said Chris Monk, learning co-ordinator at the organisation. Some of these are in display cases, he said, but the majority form part of an interactive exhibit that recreates a 1980s classroom. Many times a week school groups visit this exhibit to find out about the social history of micro computers and to get a taste of what machines could do in the days before tablets, smartphones and laptops, said Mr Monk. "We want to find out whether people have got skills out there that can keep the cluster alive as long as we can," he said. Anyone with appropriate skills can contact the museum via its website. Some students studying computer science get a chance to use the machines and programme simple games in BBC Basic, he added, saying that using the language can be a revelation. "A lot of the students are used to using Python and they know how fussy that can be when you do not put your indents in the right place," said Mr Monk. "But BBC basic does not care as it was designed to be quite tolerant of spacing and it tries to give them sensible error messages." Valerie Quaye, an ICT teacher from the Kings of Wessex Academy in Cheddar, Somerset, who regularly takes students to TNMOC to try the BBC machines, said the hands-on experience was "invaluable". "We do teach programming but it is much more text-based," she said. "They do not see the output until they have written a lot of code." By contrast, she said, working on the BBC Micro was much more immediate. "It hooks them in even though it's quite basic," said Ms Quaye. "They get over the basic graphics very quickly." Owen Grover, a volunteer at the museum who currently helps maintain the cluster of BBC Micro machines, said they held up well despite being more than 30 years old. 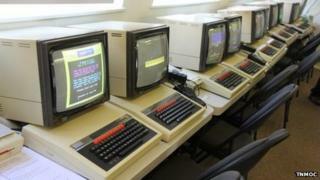 The BBC Micro was "pretty robust", he said, because it was designed to be used in classrooms. This meant that refurbishing machines for use in the hands-on exhibit was usually fairly straightforward. "The main problem we need to sort out is the power supply," he said. "There are two capacitors that dry out and if we do not replace them they tend to explode and stink the place out. So we change them as a matter of course." General maintenance on the machines includes replacing keys that stick and the occasional component that fails. Thankfully, he said, there were few custom-built components in the machine so getting spares is easy. Harder-to-obtain parts are cannibalised from broken or faulty machines the museum has in its stores. "The good thing about them is that they are repairable," said Mr Grover. "We are not going to be repairing power supplies in modern equipment in 30 years' time because they are not designed to be opened up and replaced."